My self-selected topic was identity, and my chosen subtopic was heritage, specifically what we inherit from our families/parents. These things can include physical attributes, such as appearance, or more intangible things like culture, cuisine, language, or even things like mental illness, which finds itself in between the two. My proposal for my final is to make an installation-based piece that incorporates digital elements while finding a common ground in something that is physically interactive and performative. This sort of dichotomy stems from the two sides of my topic’s “spectrum” – things that are physically visible and apparent versus things that are more abstract and not immediately accessible. This builds off a previous project that I did for Drawing/Imaging, where I used the laser cutter and a sheet of acrylic to make a makeshift vintage “iMac”. By the use of a projector, I projected on the backside of the sheet to make a “computer screen”. With this project, I’m hoping to build off of these principles by way of the mirror. The mirror is noted for its semiotic existence as a space for self-reflection and introspection. If all goes as planned, the mirror should project onto my own body. What is projected is to be exactly determined, however, I want it to include a mix of archival footage of my childhood and my upbringing while also incorporating “stock footage” of the topics that I’m specifically dealing with. This piece finds itself right in between performance and installation art. I want to experiment with performance because some of the things we inherit are performances; our entire personality and existence are performances that we’ve learned since infantry. I was namely inspired by the “Programmed: Rules, Codes, and Choreographies in Art, 1965–2018” exhibit at the Museum of Modern Art. 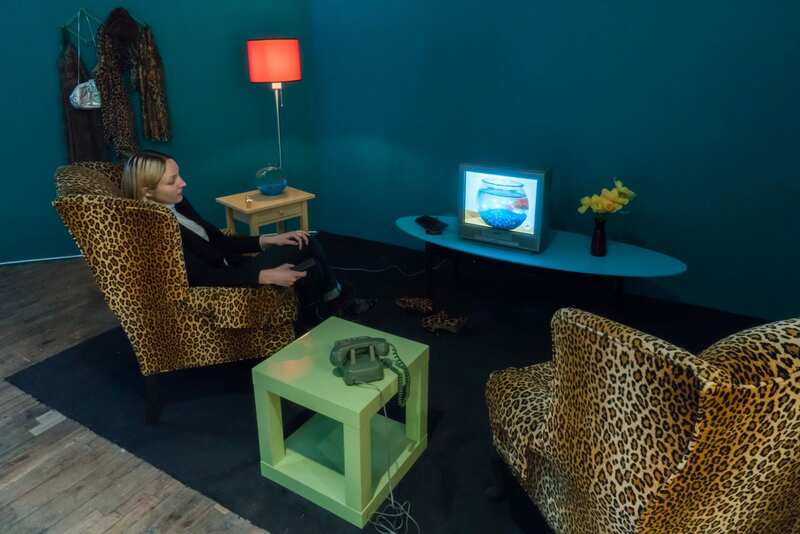 A piece that particularly stood out to me was “Lorna” by Lynn Hershman Leeson (pictured below). Create a prototype of your final project idea. The prototype is a draft of your idea – not a fully realized artwork, but more than a sketch. You can use any medium you want. Think of it as a complete artwork, but perhaps either shorter (if time-based, like a video/movie/or audio exploration) or with a cheaper material than you would ideally use for the final version. Take a photo of the work and upload it to your LP post. Bring the prototype to class on April 15th. My concept is to make a hybrid between installation and performance, a piece that examines what it means to inherit through the use of projection. The projections would include archival footage of the artist, in addition to various cultural moments and institutions that reflect the sentiments and public perception of the artist’s own heritage and ethnic background.